The pouring reinforcement of the crack on the wall, beam and pillar of cement concrete, fast curing and excellent structure. The pouring reinforcement of the crack on the wall, beam and pillar of cement concrete, fast curing, and excellent structure. The pouring reinforcement of the crack on the wall, beam and pillar of cement concrete, fast curing, low exothermal, bubble less, and excellent structure. Sandy paste, used for the reinforcement of steel plate and for D.I.Y sealing of crack, used for the bonding of marble and artificial gardening. 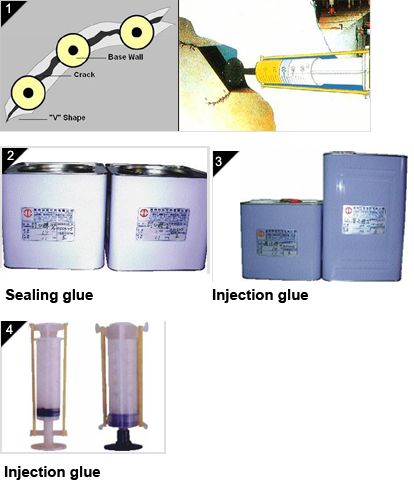 Light resin mortar, specific gravity less than 1, used for repairing & modeling of plastic. Using grinder bar to mill the "v" shape of crack, then press the base wall with manual or automation syringe. Injection of seal glue 1036A/B into the "V" shape of crack to fill the crack. Using cylinder to inject epoxy resin and hardener 2100A/B into base wall, after curing of seal glue, take advantage of its own shrinkage of base wall, the strength of wall structure will be enhanced 5 times than original wall structure. 1.Floor treament: It must keep the plain floor free from dirt. It is necessarilly to rub off the residual particle such as grease and moss. The floor must always dry and no water before implementing epoxy flooring. Base glue:To enhace the bonding of cement and top glue (dosage 0.3kg/m2). Mixing 2040A and hardener 2040B with the ratio of 2:1. Then spread onto the cement by using brush or roller. Top epoxy resin : The purpose is to heat insulation and water proof. (Dosage 0.8~1 kg/m2). Mixing 1016AT and 1016BT completely and coating on the surface of the base glue. It must be spread on carefully in order to get a smooth surface. It allows to step on after 2 days. Light loading : The weight is 1/5 of the weight of steel. Excellent elongation ability : The elongation ability is 10 times better than elongation ability of steel, suitbale for reinforcement of MRT station and viaduct. Durable : Able to stand for the sunlight for about 30 years. Ease to work : Short working time and no maintenance needed. Wet ground tolerance, new-old cement adhesive,non-sagging water based painting. Wet-surface tolerance, concrete cement surface, suitable for project in the water. 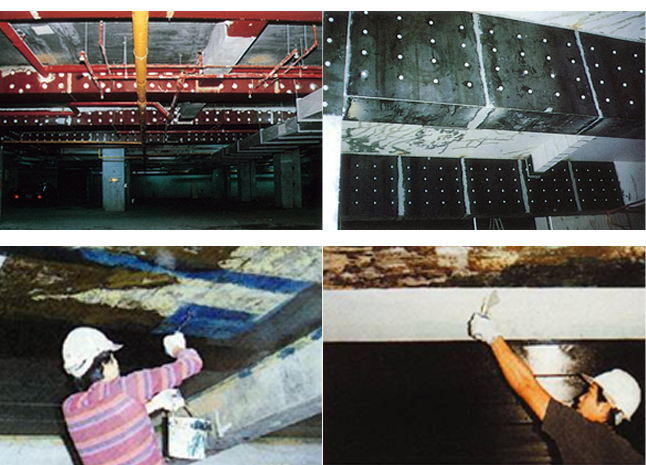 2.Epoxy resin for repair engineering under the wet condition such as tunnel, port and subway tunnel. Pre cleansing of the wall.